Our goal at TeachPitch has always been to help teachers learn more and find the best possible way to equip you with the necessary tools to thrive in today’s digital economy. 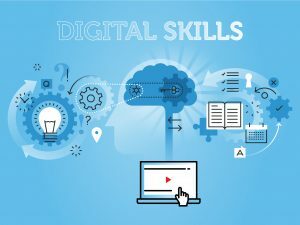 In a report in 2016 (page 9) the UK Government recommended that, at all times, educators should have access to programmes that allow them to acquire and update their digital skills, and we know that the need for this type of continuous digital skill development will expand as we develop into the next technological era. TeachPitch started out aiming to resolve the problem of information abundance by curating education resources on our platform, allowing teachers and schools to discover the most relevant resources at the right moment in time. As of today we are extremely excited to present to you the next stage in our journey, our brand new exclusive Digital Skills Course! The course consists of a series of monthly webinars spread over the course of a year, covering a range of topics such as; digital teaching tools and methods, video teaching and learning, using technology to address the special needs of pupils, advances in augmented reality and much more! Our aim is to equip the teachers of today with the right tools to continue educating the students of tomorrow. We have been hard at work to provide you with a new interactive platform which will allow you to view the monthly webinars as they are live streamed, and access recordings and materials from the webinars that have already taken place. Thanks to the great feedback provided by teachers and educators from various backgrounds, we have been able to create a digital course that is currently being adopted by learning institutions to digitally train their staff at an affordable price. Over the next two months we plan to launch the first version of our course and will commence working with our first cohort of users to schedule the webinars and tailor our product to suit your needs in the best possible way. At TeachPitch we know that the only way to deliver the best product possible is by working handing in hand with our teachers from day 1. In addition, we are offering our first webinar free of charge via Eventbrite for all our TeachPitch users. If you are interested please sign up here to get exclusive access to TeachPitch Teacher Natalie McGuinness from London in the United Kingdom talking about Digital Teaching Methods & Tools! See for yourself how you can interact better with your students whilst simplifying your workload and saving yourself time while doing so. We will be announcing more about the course over the next few months so watch this space! We support you and your organization in moving ideas to action by establishing effective processes and helping develop leaders. Would there be any certificate given to the participants of the course?